Think of a distance of about 200 miles, approximately from Santa Barbara to San Diego. This is about how many miles we are from space, says space architect, researcher, and educator Barbara Imhof. “We always think that space is far away, but it’s not. It’s really here and we are in space,” Imhof told a UC Santa Barbara audience. Imhof recently gave a talk in Elings Hall entitled “The Stars Look Very Different Today (David Bowie)” as part of the Media Arts & Technology “Seminar” series. Throughout the talk, Imhof explored the implications of space as an environment for future habitation by describing the projects she is working on with her company LIQUIFIER Systems Group. “Our main vision with our projects, step by step, is to create the basic elements for a future lunar or martian base,” she revealed. Barbara Imhof preparing for her “The Stars Look Very Different Today (David Bowie)” talk. Imhof studied architecture in cities such a London, Vienna, and Los Angeles, and then ventured into the study of space. After combining these two disciplines, she co-founded LIQUIFIER Systems Group in 2003 in which experts from a variety of fields innovate and explore outer space while seeking to improve the quality of life on Earth. Imhof began her talk by showing the audience a video of the International Space Station, a project put together by many countries, to give an example of an environment created for space. “When you look up in the sky...you see, sometimes, this twinkling, big, fast moving star. But it’s not really a star. It’s a satellite. it’s a space station,” Imhof said as she described the orbiting vessel. Imhof said this habitat shows us that architects such as herself must accommodate their design of environments in space to a harsh atmosphere. “You don’t need beds, you don’t need chairs, you don’t need tables, so everything you’ve learned during your studies you can forget about,” Imhof said. With this in mind, Imhof and her team at LIQUIFIER create a variety of projects that focus on food supplementation, self-sustaining buildings, and a place to survive in space. Space architect Barbara Imhof speaks about her projects at UC Santa Barbara. Eden ISS is an experimental greenhouse designed to advance technologies for food production. The system uses special lights, plant trays, and nutritional sprays to provide year-round food supplementation. Imhof said the team has had much success growing many fruits and vegetables, but there are two that seem to have a problem: red peppers and strawberries. Of course, growing food is essential to advancing in space but what about growing as part of a building? The notion of self-growing houses that blend architecture and biology (Growing as Building) is another of the innovative projects that Imhof has introduced. “Find biological role models which could be turned into living architecture,” she said, outlining the project’s main purpose. Team members have conducted successful experiments using Mycelium, an underground living organism, to grow on structures. They also used local materials in a project called Regolight, where solar light was concentrated to glue sand together to form building elements. Towards the end of the talk, Imhof described MoonWalk, which simulated a spacesuit underwater to recreate realistic dimensions of space. In that project, innovative technologies created conditions for cooperative interactions between an astronaut and a small rover, which gave the researchers better ideas for how to design. “We have our office, but we also work in all these different environments,” Imhof explained. Currently, Imhof and her team are working on the Gateway Project which is being developed on a conceptual basis. “Gateway is supposed to be a smaller outpost pushed further into deep space, really learning about the conditions in deep space in preparation for traveling to Mars,” Imhof revealed. 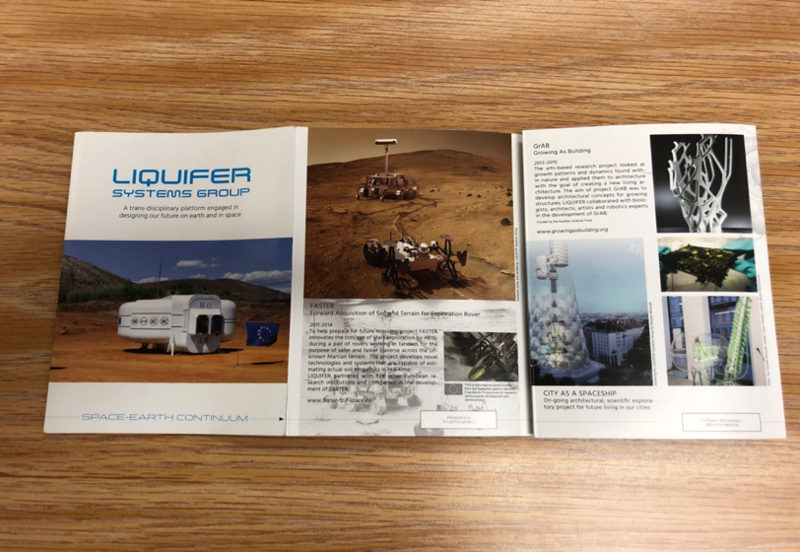 A pamphlet that briefly outlines the projects that Barbaraa Imhof’s LIQUIFIER Systems Group develops. As she guided her audience through the projects, Imhof emphasized that the number one priority of all this research and design is to focus on the essentials of human life. “Start from human perceptions. What do I need to survive there? A place to sleep, hygiene facilities, kitchen, and the systems must be accommodated as well,” Imhof concluded. Imhof stressed that her team develops projects that will allow us to meet the needs of humans in the conditions of space, until maybe one day our descendants will reside in that environment. Mia Sheffield is a third-year Communication major pursuing the Professional Writing minor.